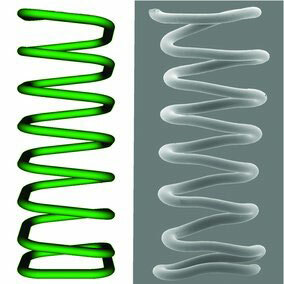 (Nanowerk News) Various microstructures including straight filaments, layer-by-layer scaffolds and freeform helical spirals are fabricated by a solvent-cast three-dimensional printing technique, as reported by Professor Therriault and his co-researchers ("Solvent-Cast Three-Dimensional Printing of Multifunctional Microsystems"). The solvent-cast direct-write fabrication of microstructures is shown using a thermoplastic polymer solution ink. The method employs the robotically controlled microextrusion of a filament combined with a rapid solvent evaporation. Upon drying, the increased rigidity of the extruded filament enables the creation of complex freeform 3D shapes. The fabrication capabilities of this powerful and flexible process are demonstrated by the printing of three microsystems featuring mechanical, microfluidic and electrical functionalities, such as a high-toughness microstructured fibre, a 3D microchannel and a Ka band antenna. These capabilities can be extended through the utilization of other thermoplastic-based inks and the printing of features at the submicrometer- and potentially nanoscale. This is the first scientific publication by Shuang-Zhuang Guo, a doctoral student in mechanical engineering under the supervision of Professors Therriault of the Laboratory for Multiscale Mechanics (LM2) and Marie-Claude Heuzey of the Department of Chemical Engineering, both members of Polytechnique's Montréal's Centre for Applied Research on Polymers and Composites (CREPEC).